If I made a list of the top 10 kitchen tools I can’t live without, my grill pan would be one of the items. It allows me to grill year round regardless if rain, sleet, snow or hail are pounding down on my outdoor bbq. The delicious shrimp for these tacos are prepared on a grill pan. They’re flavored with freshly squeezed lime juice, cumin and paprika. 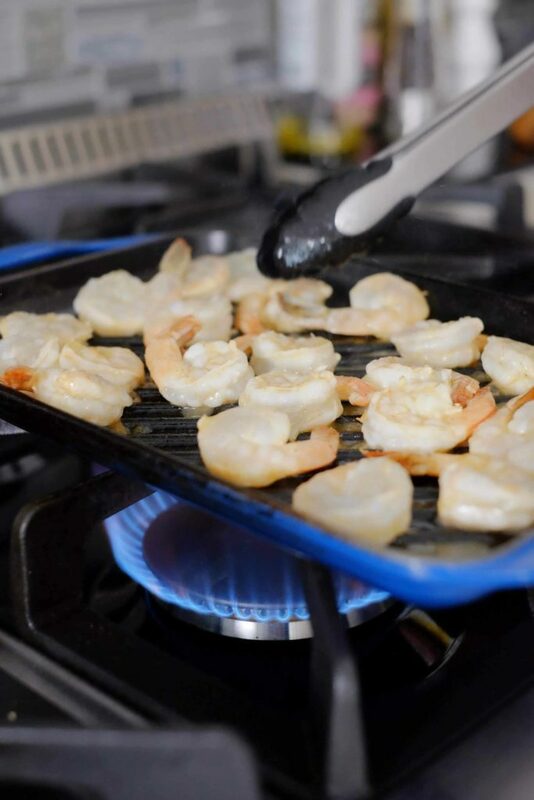 Once the shrimp come off the grill, they’re cooled slightly then cut into bite-sized pieces. Is it Better to Use Fresh or Frozen Shrimp in This Recipe? I prefer using frozen shrimp. They’re fresher and less expensive than fresh shrimp. Thaw frozen shrimp in the refrigerator overnight before using. Clean and devein the shrimp once they have thawed. The homemade purple cabbage slaw has shredded carrots, scallions and other seasonings mixed with Greek yogurt. The yogurt lightens the dish and replaces the traditional use of mayonnaise when making slaw. 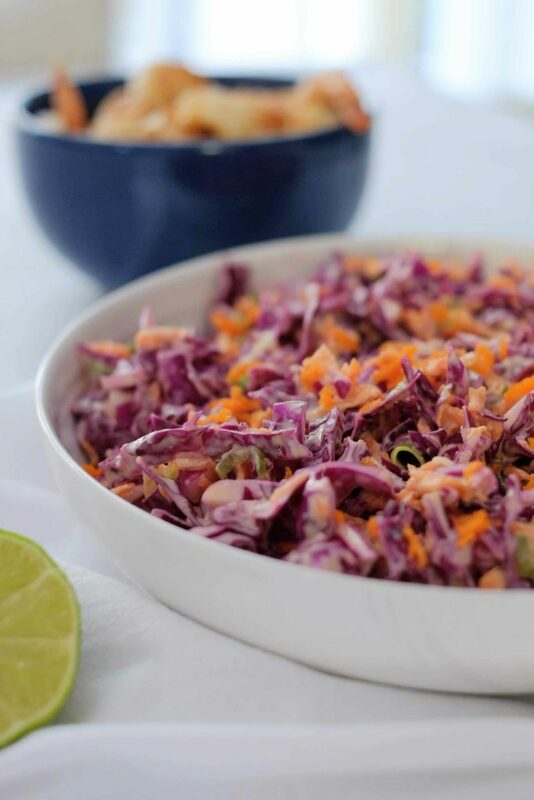 You can purchase pre-shredded cabbage to put the slaw together faster. You can also substitute green cabbage for the purple. 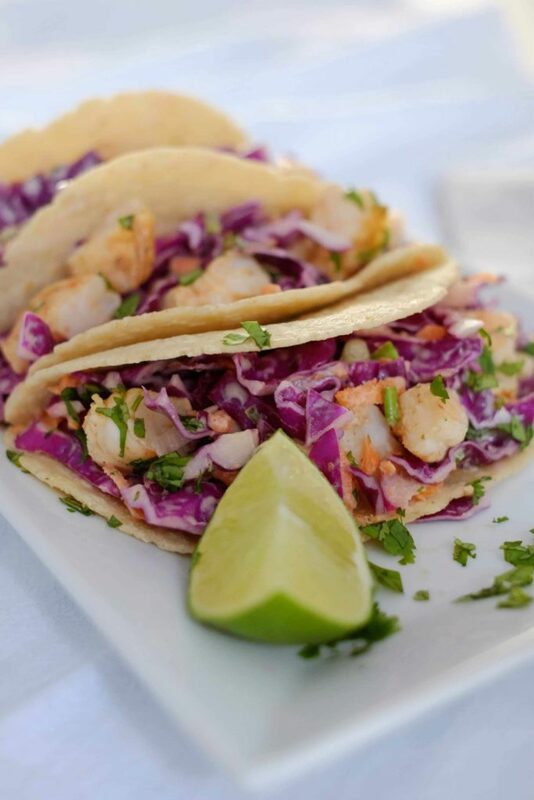 The grilled shrimp and cabbage slaw come together inside a warm tortilla: corn or flour, your choice. Squeeze a little fresh lime juice and chopped cilantro over the taco and enjoy. 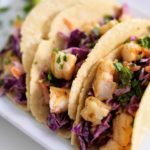 Grilled Shrimp Tacos with Cabbage Slaw is a simple, colorful dish to serve for a weeknight dinner. These tacos are cooked on a grill-pan so they can be enjoyed year round. In a large bowl combine yogurt, vinegar, lime juice, olive oil, sugar and celery salt. Mix well. Add cabbage, carrots and scallions. Mix well, coating the vegetables evenly. Cover and refrigerate until ready to use. In a large bowl combine the olive oil, lime zest, cumin, paprika and salt. Mix well. Add shrimp and evenly coat them with the olive oil mixture. Cover shrimp and store in the refrigerator for 15 minutes. Preheat grill pan or skillet to medium-high heat. Add shrimp and cook until they are pink and slightly opaque. This will take about 1 - 2 minutes per side to grill the shrimp. Immediately transfer to a bowl and add the fresh lime juice to the shrimp. 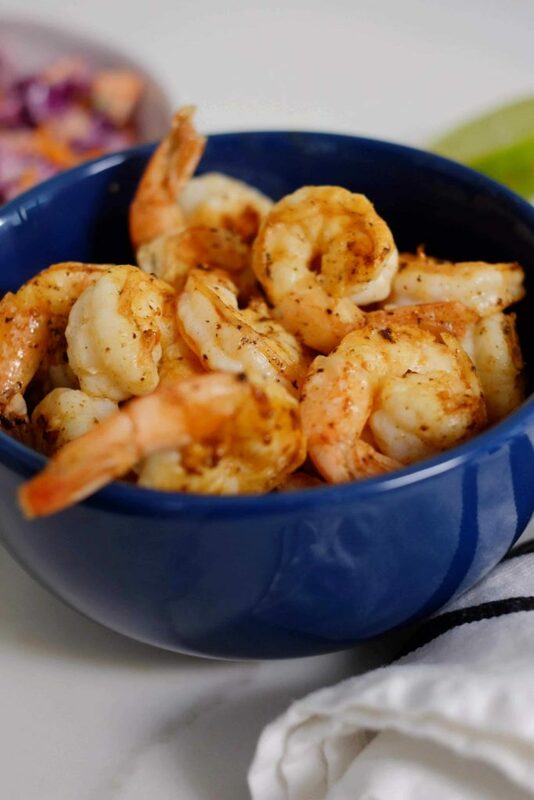 Allow shrimp to cool slightly then cut into bite-sized pieces. Cover to keep warm. Heat a dry skillet over medium-high heat. Warm a tortilla in the pan for about 20 to 30 seconds on each side. 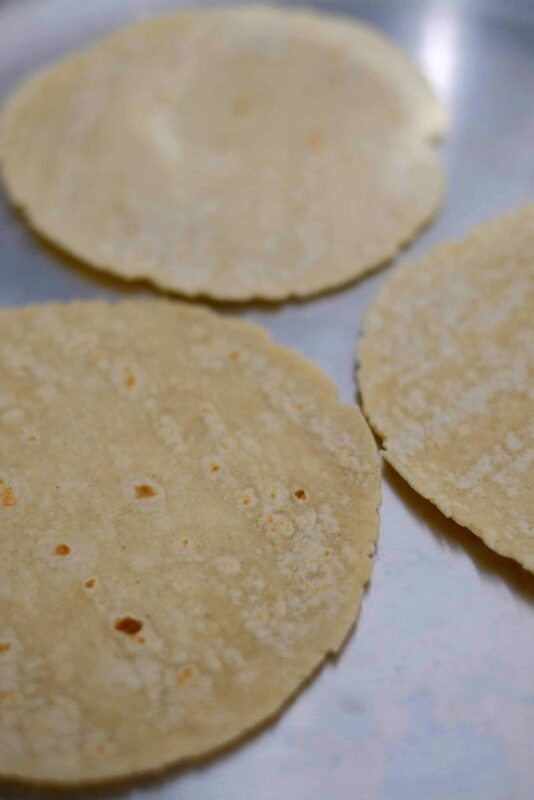 Repeat with the rest of the tortillas. 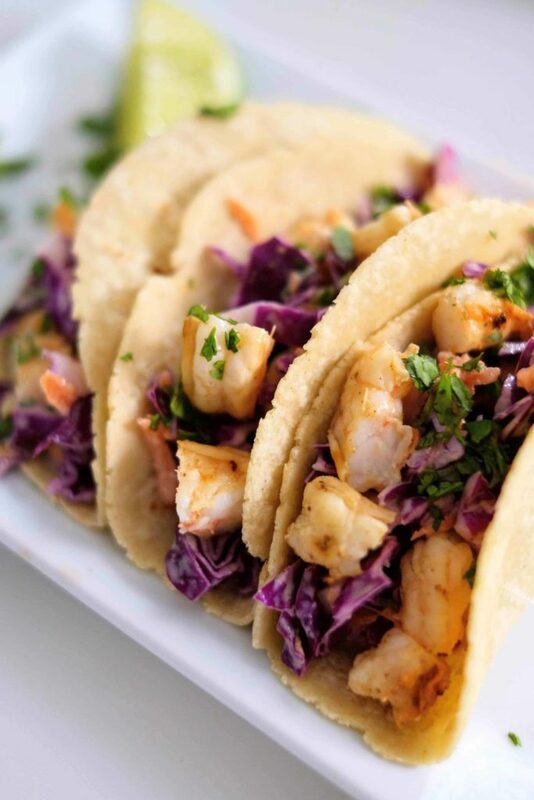 Build the tacos by filling them with grilled shrimp and cabbage slaw. Garnish with cilantro and lime wedges if desired.